How does Finance use a CPQ (configure-price-quote) system to grow revenue and drive profitability? The Finance department does more than count the beans. Rather than being relegated to the sidelines keeping score, enterprises are looking to Finance to play a larger role, both strategically and tactically, in the management of the business. Finance is expected to make meaningful contributions toward helping the enterprise boost revenue, increase margin and improve operational efficiency. CPQ technology can help Finance do just that. Companies love the annual rite of planning the path forward for the coming year. This annual event is almost entirely focused upon two numbers: projected revenue and projected expenses. Revenue is mainly based on forecasted sales, and the expense number is mostly based on paying for the activities necessary to achieve the forecasted sales. Growth is achieved by reinvesting the profits from previous sales into expanding the business capacity of the enterprise, literally paying for the additional people and building out the processes and infrastructure required to drive that expansion. The specific plans proposed to achieve these revenue targets are the figurative horses that management must bet on to complete their annual plan. Finance is uniquely equipped to offer validation of the plans as proposed. But, more importantly, Finance can offer real direction to improve the chances of the plan’s success. Finance requires two things to accomplish this: data and information. 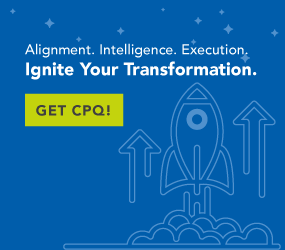 CPQ can be the essential tool that provides the information that Finance needs to participate in the strategic and tactical planning discussions. CPQ data illuminates specific performance metrics related to individuals, departments, territories, products and options. That data identifies the performers and non-performers—those people and products who have exceeded expectations and those who have not. More importantly, that data can be used as grist for any number of sophisticated analytical tools that Finance has at its disposal to extract the kind of information needed to predict success, improve planning and drive successful management of specific business processes and the enterprise as a whole. Let’s look at some specific CPQ product performance data types and see how Finance can contribute to the interpretation of what that data reveals. Just because a product can accomplish a specific requirement, doesn’t necessarily mean it should be marketed or promoted for that ability. Finance can help identify where specific product configurations are actually creating liabilities once they are in the field or, perhaps, simply costing the company more money to maintain the inventory necessary to offer the option than the company receives from the sale of that option. CPQ makes product data available for analysis to ensure that companies are optimizing their buying and selling processes. Finance, from its vantage point, can see the impact of a product across the entire enterprise. What looks like a fair price at the point of sale may in fact be costing the company money after the sale in warranty work. Conversely, hot-selling products may simply be under-priced products and point to the company leaving money on the table every time a copy is sold. CPQ helps the Finance Department validate the prices of products to ensure healthy margins by setting parameters that control pricing, discounting and promotions throughout the sales process. When is a market viable? Selling products into the medical device market is vastly different than selling them into the office products market. CPQ enables Finance to see where the company is spending money on certifications that don’t support sales volumes that pay for themselves. In addition, medical, GSA and many other market regulatory requirements can be very expensive. Finance can help you identify where to reduce the markets you address and increase your profitability at the same time. If a company’s product is selling well in one territory and not in another, finance can help examine potential reasons why this might be happening. With a robust CPQ system, Finance can analyze the sales performance and look at other factors related to where products are sold. Maybe boosting the sales force in the underperforming territory is all that’s needed for improvements. Perhaps modifying the product can open more opportunities. Perhaps abandoning a specific territory is necessary. CPQ data can enable Finance in helping to make this call. Sometimes making a profit can blind us to the real profit potential available. Channel sales are an area where this is most definitely true. CPQ enables Finance departments to evaluate the actual sales numbers and the models of products sold via a given channel to reveal how that channel is performing in light of their actual potential. A CPQ solution helps companies optimize omni-channel sales and distribution. CPQ data identifies sales by product, option selected, configuration, customer type and location. This information, coupled with individual sales rep performance, territory performance and market performance can provide useful data for Finance to analyze. That analysis helps Finance help the business. A CPQ system gives Finance visibility into the entire transactional process, from product development to sales, manufacturing and customer feedback. CPQ helps Finance more effectively evaluate, advise and make recommendations related to the allocation of resources by helping management balance opportunity risk with opportunity potential. This is what Finance does best. CPQ equips them to deliver critical input on lean operations, risk reduction, effective process improvement and tactical planning for the coming year. Finance helps the enterprise by increasing the potential for success related to any marketing plan, sales campaign, product development decision or expansion plan.